Kuoleman Galleria are a band from Finland that plays black'n'roll and this is a review of their 2016 album "Karsmys Kunnian" which was released by Inverse Records. Water sounds and aggressive spoken word samples start off the album before going into more of a heavier black'n'roll direction that also uses high pitched black metal screams and a small amount of death metal growls and the guitar leads are done in more of a melodic fashion and you can also hear all of the musical instruments that are present on the recording. Melodic vocals can be heard in some of the songs along with a brief use of clean playing while the heavier riffs are very catchy and also utilize a great amount of energy and the music for the most part sticks to a mid paced musical direction and some songs also bring in a touch of punk and thrash as well a s a brief use of back up gang shouts and they close the album with a cover of Barathrum's "Last Day In Heaven". 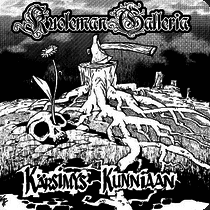 Kuoleman Galleria plays a style of black'n'roll that is very catchy with a lot of energy in mostly a mid tempo direction while other songs also display more of a melodic side, the production sounds very professional while the lyrics are written in Finnish and cover Sarcasm and Dark Humour themes. In my opinion Kuoleman Galleria are a very great sounding black'n'roll band and if you are a fan of this musical genre, you should check out this album. RECOMMENDED TRACKS INCLUDE "Karsimys Kunnian" "Aivokuollut jattelija" "Elaman Irvikuva" and "Last Day In heaven". 8 out of 10.